The digital simulator is said to be Event Driven. An event is essentially a change of state e.g. 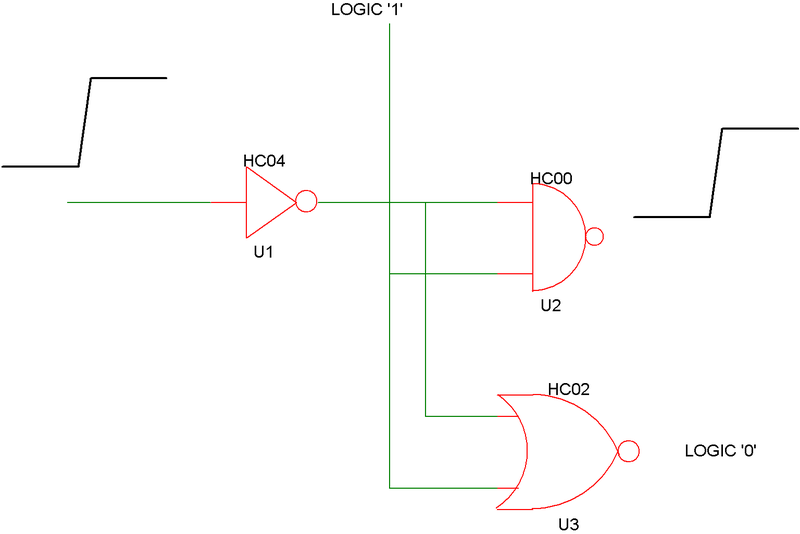 a gate output changing from logic '0' to logic '1'. When an event occurs on an output, all devices with inputs connected to that output are notified of the event and can respond appropriately by generating new events. For example, consider the following circuit fragment. U1 receives an event, a rising edge at its input at time = T. U1 has a propagation delay of 5.5nS, so on receipt of the event at its input, U1 posts an event at its output with a time T+5.5nS. At that time this event is received by U2 and U3. U3 does not respond to this event because one of its inputs is permanently at logic '1' so its output will always be low. U2, however, does respond and creates a low-high event at a time delayed by its propagation delay of 6.5nS i.e. T+5.5nS+6.5nS. Any device with an input connected to the output of U2 will process this new event and so the process continues. In addition to the propagation delays described above, there are also additional delays caused by loading effects. Each input has an effective input capacitance and each output a resistance. For each event, an additional delay is added equal to the sum of all capacitances on the node multiplied by the driving output's resistance. Connections between the analog and digital system are made via special interfaces bridges. (As described in Analog to Digital Interfaces these bridges are implicitly included by the simulator and it isn't necessary for the user to wire them in.) The digital to analog interface has an output that looks like - to a first approximation - an analog representation of a digital gate. This output changes voltage at a specified rise and fall time when the digital input changes state. More importantly, the analog system is notified when an event occurs at the input to a D-A interface bridge and a timestep is forced at that time. This is known as a breakpoint and is the analog equivalent of an event. The analog system is only notified of events that occur at the input of D-A bridges. It knows nothing of events that are internal to the digital system. Analog to digital interface bridges are much like a comparator. When the analog input passes a threshold, the output state changes appropriately and a digital event is generated.